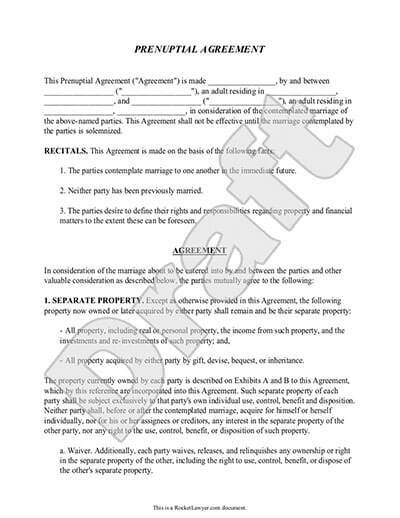 A Prenuptial Agreement is a financial contract agreed upon before two people wed. It is a two-way contract intended to protect both spouses' assets and to outline who carries the burden of specific debts. Prenups are not just for the rich and famous, they are suitable for any couple who wants to responsibly manage their finances, whether they are together or separate. Before marriage you want to decide how assets each of you already own will be managed. Your family wants to protect you or your children's expected inheritance. You plan on taking on debt you don't want your spouse to be liable for. You want to protect a personally-owned business or business partners ask you to shield your mutually-owned business. You do not want your default state laws to control the distribution of property. Prenuptial Agreements are two-sided contracts signed before a couple is married. It outlines each spouse's assets and debts, and expected future assets and debts, and how they will be managed if the partners choose to part ways, voluntarily or by death. A Prenuptial Agreement, often called a Prenup, is simply a financial contract between two people before they are married. It outlines the assets and debts of each person and how assets and debts should be managed if the relationship dissolves or a spouse dies. Prenups are increasingly becoming more common as people are choosing to marry at a later age than people did in the past. Why are couples choosing a Prenup Agreement? Financially responsible partners are often now considering establishing a Prenuptial Agreement before marriage. This is especially true of those entering a second or third marriage. A well thought out Prenup can protect both spouses financially. To protect the inheritance rights of children from a previous marriage. To protect business interests, especially if you own a company with others. One partner is choosing to relinquish their career and needs to be protected if the marriage dissolves. In some states, spousal support amounts can be outlined in the agreement. To protect pensions or retirements earned before the marriage. To protect family-owned properties such as an inherited home. To separate debt obligations acquired after the marriage. To shelter one person from the debt the other accumulated before marriage. They want to decide what happens after a divorce rather than being subject to default state divorce laws. To establish agreements amicably and fairly while relations are supportive and positive. Net worth or earning potential vary greatly between the spouses and they want to build fair financial protections for both. There is a large age difference between the partners and the older person's retirement and long-term healthcare requirements need to be protected. You can easily make a Prenuptial Agreement using our document builder. All you need is each spouse's financial information and the ability to agree on how to manage your future finances. If conversations have proven difficult, you can consult with a mediator, counselor or religious advisor to help mediate the emotional parts of the conversation that may arise. Once the agreement is composed, you may also want to have it reviewed by a lawyer. Additionally, it should be amended through the years as your financial situation changes. If you ask your accountant or lawyer, they'd both likely say everyone. If you ask a family member or friend, you might hear a different answer. If you ask someone who has experienced a difficult divorce, they will likely say everyone, as well. Many people have opinions about prenups but ultimately, it is up to you and your future spouse to decide if your marriage will benefit from having a Prenup Agreement. What financial information is included in a Prenup? While some young couples have not yet accumulated a lot of assets and debt, many couples these days do. Statistics are even showing that since millennials are getting married older than previous generations, they have more to bring to the marriage than they would have if they married ten years younger. Some unmarried people have spent a lot of time building their own business, assets and retirement accounts, and some have also amassed a volume of debt such as student loans, credit card debt, mortgages or tax debt. Whether assets or debt, all clean or dirty financial laundry will need to be aired to create a comprehensive Prenuptial Agreement. Even if you have an asset such as a pension that you plan on retaining for yourself, you still need to reveal that it exists. It is also smart to view and share your current credit reports to ensure that you are not missing a debt and can see what each other's credit worthiness currently is. Parental rights. Prenup Agreements cannot protect or enforce parental rights. If you decide to divorce and have mutual children, you will need to go through mediation and or court to decide custody arrangements. Maintenance waivers. In some cases, a Prenup may not support the waiving of maintenance (alimony and palimony) payments. While that information can be included in the agreement, the court may review the maintenance at the time of divorce and change the amount if they feel the waiver is unfair. Incentives for divorce. Judges may look for provisions in the agreement that appear to provide monetary incentives for divorce. Non-financial agreements. Most judges do not want to see personal information such as who you are to spend holidays with in a Prenuptial Agreement. You can make those agreements in a separate document if needed. Signing under duress. If the judge deems that either party appeared to sign under pressure they may choose to not support the agreement and divide assets according to applicable state laws. For this reason, most lawyers suggest that the document is signed well in advance of the wedding. There is a bit of taboo-type thinking surrounding the idea of asking for a Prenuptial Agreement. However, even if you do not compose a formal document, you need to be able to openly talk about finances and not just the fun stuff like the idea of buying a house someday, but also the hard stuff like how much debt you have, your credit rating and financial obligations to others (like child support or elderly care). Many marital disputes arise from money issues. It is beneficial if you and your partner can willingly and rationally discuss finances before problems arise. Your marriage may be the most important legal partnership you'll ever enter. Like business partners, you will have responsibilities, contributions, assets and debts, skills and talents, and more you are bringing to the relationship. And together your goal is to stay in business and be solvent. Solvent for both partners, whether together or not. You've already established your love and commitment to one another, the next step may be to decide how best to manage your financial future. A current trend is couples opting to create a Conflict Resolution Agreement rather than a traditional Prenuptial Agreement. A standard Prenup discusses what may happen financially if the couple parts, whereas a Conflict Resolution Prenup outlines ways the couple agrees to try to resolve conflict should they ever reach a point where they are considering a divorce. You would not use the Prenup template that we provide for this type of conflict resolution. Our contract is for Financial Prenups. Instead, you might consider working with a lawyer or professional mediator to draft the agreement. Can we sign a Prenup Agreement after the wedding? While it is not common, yes, you can sign an agreement after the wedding. In fact, you can make a financial agreement any time during your marriage. Most couples sign their agreement before the wedding since everyone is on good terms and excited about taking the next big step in their life. Even if you have a Prenup in place before the wedding, you will need to alter it periodically as your financial situation changes or if you make large purchases. When you get married, you'll want to take the time to update your Will, if you have one. You might also consider adding a Living Will or Power of Attorney. Any time your family or your assets change, you'll want to update your Last Will and Testament. Using a Power of Attorney document, you can appoint someone to manage your personal and business responsibilities if you are away or incapacitated. A Living Will, often called an Advance Health Care Directive, allows you to appoint someone to carry out your end-of-life wishes. We also provide documents for your marriage celebration such as service contracts for caterers, bartenders, musicians, DJs, limousine services and venue rentals. 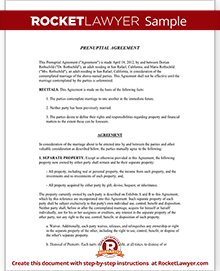 Our step-by-step interview process makes creating a printable Prenuptial Agreement easy.